Without a personal brand statement, you probably answered with your uninteresting job title. “I’m an online coach.” Cue the crickets. A dull answer, like the one above, does NOT leave a lasting impression, and it certainly doesn’t help people get a feel of the actual work you do and what makes you uniquely you. Your personal brand is what sets you apart from other competitors in your field. You’re not just another copywriter, speaker, marketer or whatever it is you do for work. You are a unique individual with a combination of skills, experience and a message that separates you from the crowd. Everything that YOU have to offer cannot be found in anyone else, and people are waiting for that message that only you can deliver. 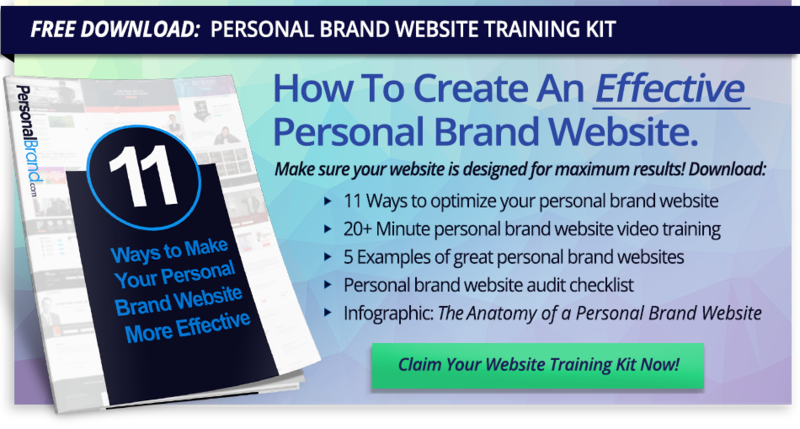 You see, having a personal brand statement that encapsulates who you are and what you stand for helps you to differentiate yourself from your competitors and authentically connect with your target marketing in a matter of seconds – both online and off. To be successful today, you need to identify what you do best, for whom you do it, and why you do it better than anybody else. You must know what makes you different so that you can stand out! Before you even think about starting to craft your personal brand statement, it’s best to observe the personal brand statements of those continually crushing it in their Personal Brands. 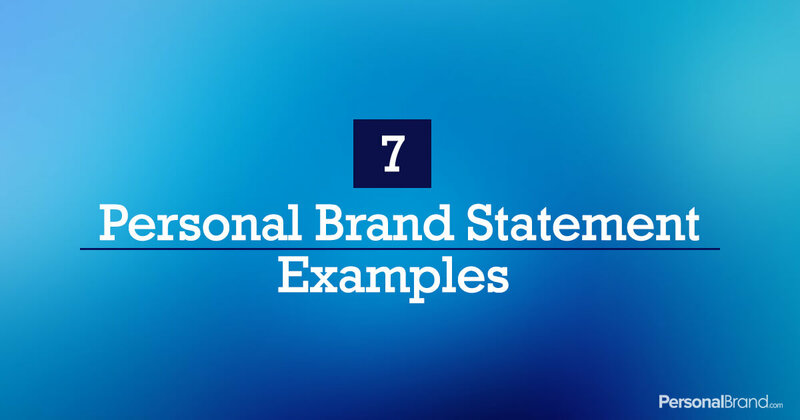 While making your way through this list, notice how no two personal brand statements are alike, but rather each statement provides an immediate grasp of the work and personality of each individual. So let’s get to some compelling personal brand statement examples! If you have a story that influences people towards positive change, I can teach you how to find the right stages that scale in both revenue and reach. Pete Vargas is a master speaker, public figure and helps people grow their businesses and spread their message through stages. He’s commonly known as the “Stage Whisperer” and teaches his students how to refine their stories, win more stages and scale stages to attract more customers. Although this personal brand statement is only one sentence, you know right away what he does best and who he serves. Short and succinct, straight to the point. The message is clear and clearly unique. I help entrepreneurs, corporate leaders and teams discover a powerful new relationship to who they are and what they do through my proprietary methodology called The Campfire Effect. Chris Smith helps people do more and be more productive by identifying five areas of their life that they can improve so they can thrive. 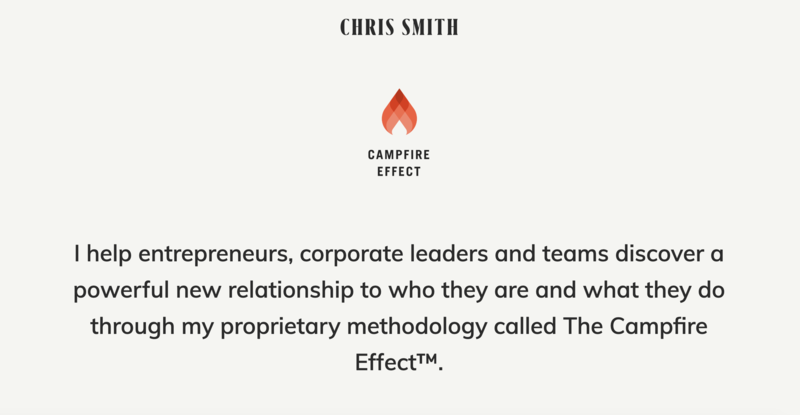 His clear and concise personal brand statement sums up his primary mission and leads the reader into a bit of mystery as to what “The Campfire Effect” really is. It can be challenging to fit in the “what makes you different” answer into a personal brand statement. Chris compacts his complicated answer into a trademarked methodology, that makes him unique an exclusive. Hi, I’m Marie. An entrepreneur, writer, philanthropist and an unshakable optimist dedicated to helping you become the person you most want to be. Talk about personality! 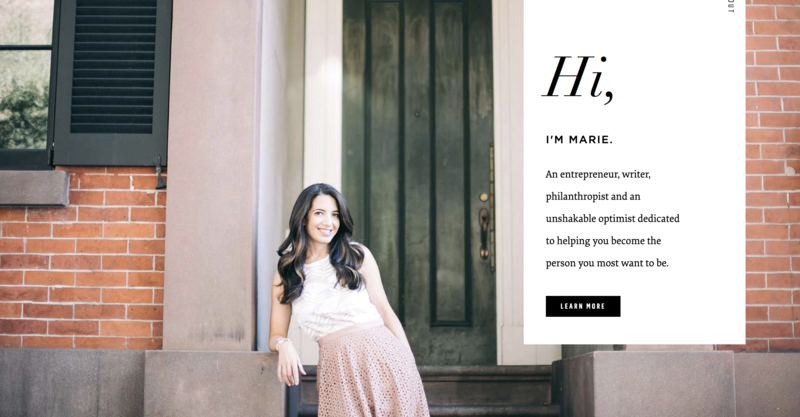 Marie Forleo thought leader, entrepreneur, and host of the award-winning show MarieTV sure knows how to teach at a world-class level while keeping it fun. Her personal brand statement is conversational and inviting with an equally balanced confident and grounded tone. If you didn’t think it was possible to show your personality in one sentence, Marie could teach you a thing or two. The statement leaves a bit of aspiration at the end, compelling the viewer to take action. Takeaway: Be yourself. Your unique authenticity is what drives true connection, so let it shine through! 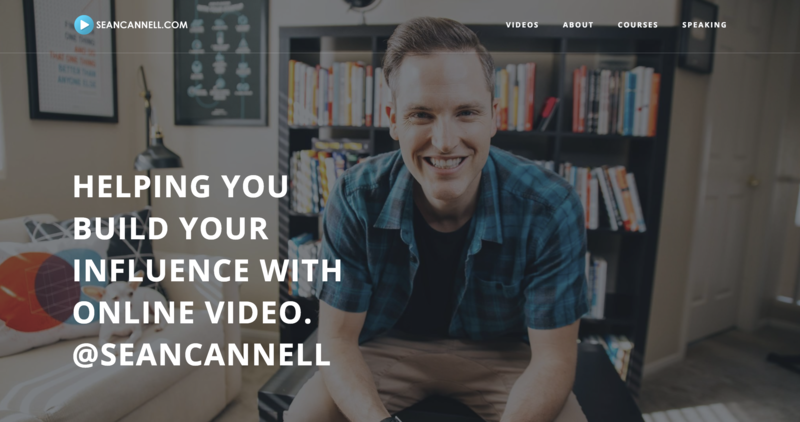 Sean Cannell is a YouTuber, international speaker, and coach that helps entrepreneurs build their influence and income with online video. He is an example of a strong personal brand, consistently dominating the creative space and inspiring thousands through video. Sean capitalizes on simplicity in his personal brand statement. His short and conversational tone used in his statement resembles that of a “personal catch line” witty and impactful all at once. The placement of his social handle @seancannell instantly had me reaching for my phone to check him out on socials, and since his field of work relies so heavily on video views, I’d call this call to action pure genius. Takeaway: Creativity can go a long way. You don’t always need a complicated statement to leave a lasting impression. I’m a publicity and marketing strategist who helps experts, authors, and coaches go from “hidden gem” to admired industry leader…and even a household name. 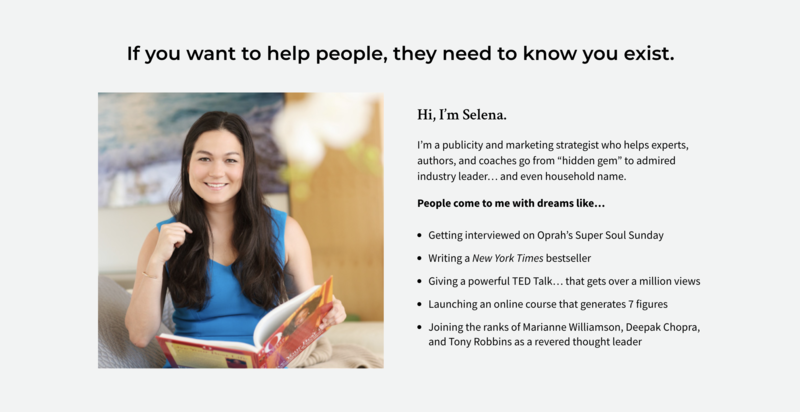 Selena Soo is a publicity and marketing strategist for visionary entrepreneurs, experts, and authors who want to reach millions with their message. A genuine and professional connection is the foundation of her personal brand, and her statement mirrors her message. Selena’s personal brand statement clearly defines what she does, who she helps and what makes her different. Her personality shines through in just a mere sentence, and her confidence boosts her credibility. Takeaway: There can be a balance of personality and professionalism. You don’t need to choose one or the other, you can have the best of both worlds! There’s a book inside you. And my goal is to help you find it and go from blank page to bestselling author- even if you’re busy, idea-less, or bad at writing like me. 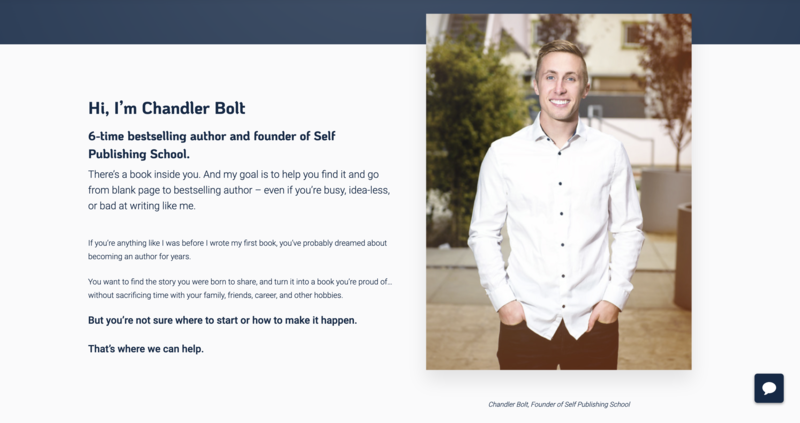 Chandler Bolt, the founder of Self-Publishing School, is on a mission to educate and teach people how to write, market and publish their first book in as little as 90 days. His personal experience as an author helped to fuel his personal brand and passion for teaching others how to write and sell books successfully. This personal brand statement is a bit longer in length, but still delivers Chandler’s unique message in condensed form. It’s witty and relatable, touching on specific pain points of his intended audience. He captures what he does, and who he serves (the busy, idea-less bad writer) and inspires the viewer with the possibility of working together. Takeaway: Get specific in the way that you answer the “who do I serve” element of a personal brand statement and stay away from cliché audiences such as “entrepreneurs” “stay at home moms” etc. We promise you’ll stand out more! 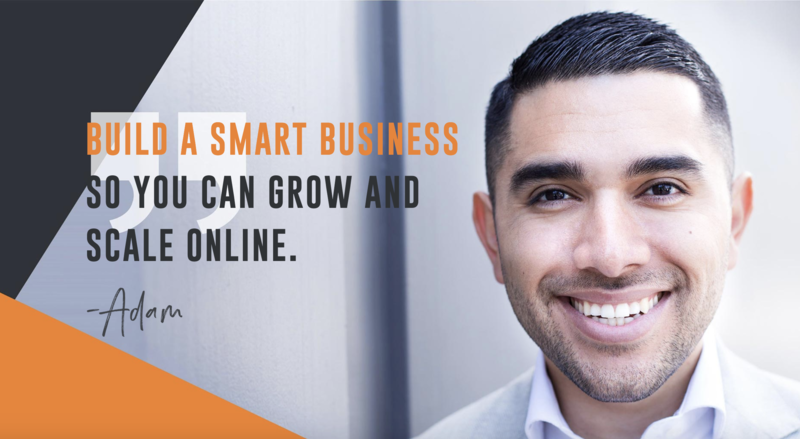 Build a SMART business so you can grow and scale online. Entrepreneur, and digital marketing expert Adam Flores is a real personal branding expert that knows what it takes to really win. His passion for helping others experience the freedom that their own personal knowledge and genuine passion can lead to is evident in every touch point of his brand. This personal brand statement is short and, yet it details exactly what Adam does, who he helps and his differentiating factor: his framework methodology, building a SMART business. The best personal brand statements get to the heart of the message in the least amount of words. In Adam’s case “the shorter, the better” is really working for him here. Takeaway: It takes users less than two-tenths of a second to form a first impression online. There is no room for fluff or filler words. Get to the heart of your message and trust that it will resonate with the right people. Although there is no “right way” to craft your personal brand statement, you should always seek to highlight your true personality, brand voice and key message to help you stand out. While taking into consideration the components of a personal brand statement, seek to create a statement that fully resonates with you and remember that it may take some trial and error before you land on a statement that encapsulates all that you want to share. If you’re ready to start crafting your statement, check out our post How to Craft Your Personal Brand Statement and drop your statement in our Personal Brand Builders Community for additional feedback! Inspiration is everywhere. Take some time to figure out what statement style fits your message, personality, and intended audience. Hopefully, our breakdown leads to some new creative ideas and makes your process of crafting your statement just a little bit easier.